Boardwalk Empire isn’t exactly starting over, but it returns following an off-season that saw big changes announced for Terence Winter’s gangster epic. First it was announced that the fifth season would be the show’s last, and would run only eight episodes instead of the usual 12. Later came word that the series would take a time jump into the Depression era for its last hurrah, skipping the rest of the 1920s to land in the waning days of Prohibition. While the first three new episodes are recognizably Boardwalk Empire, with all its charms and flaws intact, the daunting task of wrapping up the story adds a weightiness that threatens to derail the show’s final leg. 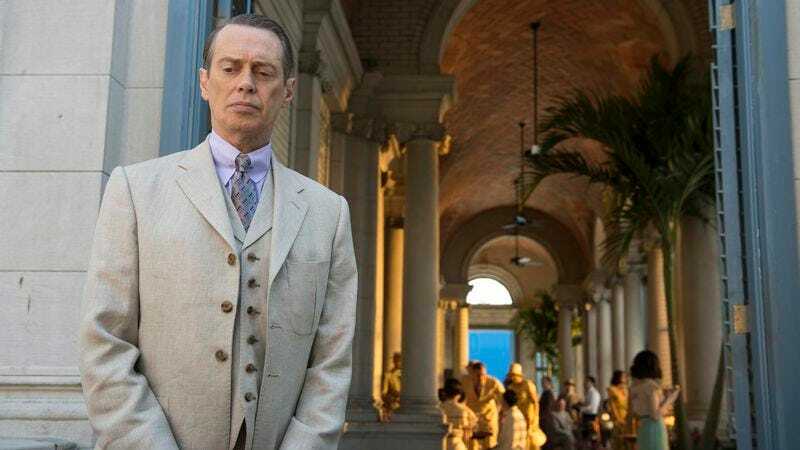 The season opener, “Golden Days For Boys And Girls,” finds Nucky Thompson (Steve Buscemi) in Havana in 1931, meeting with executives of the Bacardi rum company. Although seven years have passed since the season four finale, Nucky is in roughly the same place in terms of his motivation: He wants out of the gangster life, and sees the inevitable repeal of the 18th amendment as his ticket to legitimacy. The time jump has affected some characters more significantly than others. Most notably, Arnold Rothstein is no longer with us, having been murdered in 1928. This is by far the biggest casualty of the decision to leap ahead seven years, depriving the show of one of its richest performances (by Michael Stuhlbarg) and abruptly severing an important character’s arc. The pairing of Rothstein and Kelly Macdonald’s Margaret Schroeder was one of the more promising setups at the end of last season, but the historical record has forced Winter and company to rejigger whatever storyline might have been planned. Instead, Margaret is left struggling with the fallout of her deal with Rothstein when her company falls on hard times after the stock market crash. Closer to home, Chalky White (Michael K. Williams) finds himself in vastly changed circumstances, cut off from what remains of his family and reluctantly saddled with a new partner in crime. Gillian (Gretchen Mol) is still in the picture, though her connection to the rest of the Boardwalk world is more tenuous than ever. The time jump really pays off with the New York mob storyline, as 1931 is the year Lucky Luciano (Vincent Piazza) masterminded the bloody birth of the modern Mafia, with its Five Families structure. That’s a lot of freight for eight hours of television to bear, especially for a show that has traditionally taken its time to carefully ramp up its season-long arcs. Now there’s additional pressure to bring all of those arcs to a satisfying conclusion, which makes one creative decision in particular questionable at best: Winter has saddled the first three episodes (and presumably the rest of the season) with extensive flashbacks to Nucky’s childhood, complete with a young version of the Commodore (John Ellison Conlee in the role originated by Dabney Coleman). The flashbacks are meant to re-center Nucky in the show’s narrative, but the fourth season worked so well in part because Nucky receded into the ensemble. Steve Buscemi has always been a fine character actor, but his wry, dyspeptic performance is better suited to an oddball on the fringes than the man in the middle. Winter may feel that, with the end at hand, the time has come to truly understand Nucky before we say goodbye. That’s all well and good but, at least in the early going, the flashbacks don’t tell us anything substantial we didn’t already know. 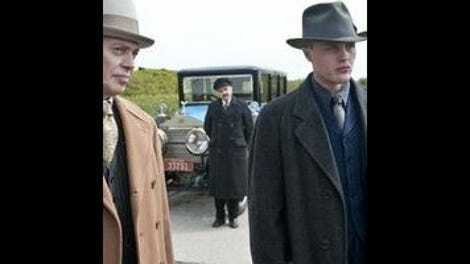 Nucky had an abusive father, his sister died young of tuberculosis, and the Commodore mentored and corrupted him. The momentum grinds to a halt every time the show returns to the 1800s, and handsome as they are, these scenes place an additional, unnecessary burden on an already overloaded narrative. The juxtaposition of the flashbacks and the Cuban-set scenes in the season premiere inevitably evokes The Godfather: Part II, a comparison that signals Winter’s lofty ambitions for the final season even as it does the show no favors. As a character, Nucky Thompson is never going to be Michael Corleone, and to strain for mythic significance at this late hour is to undermine the substantial pleasures the show still has to offer. Boardwalk’s panoramic sweep may not quite rival that of Game Of Thrones, but much of its dramatic juice derives from the collision of historical events with pulpy gangster-movie tropes. It falters when it tries to be a character study, mainly because Nucky has never been the most compelling or complex figure on the show. One knock on the show has been that, like Atlantic City itself, it’s all glittering surface and no heart. That’s overstating the case, as Boardwalk has proven to be capable of tapping into a deeper emotional well (as with the lonesome death of Richard Harrow at the end of last season). In the new episodes, Michael K. Williams is particularly wrenching as a broken, hollowed-out Chalky White. It’s well within the realm of possibility that Winter and company can pull off an affecting conclusion to the series, but as the end approaches, the degree of difficulty is higher than ever.